As the silly season draws to a close, research firm Roy Morgan has taken now as an apt time to explore how Australian drinkers feel about some of the more memorable beer commercials of recent times. 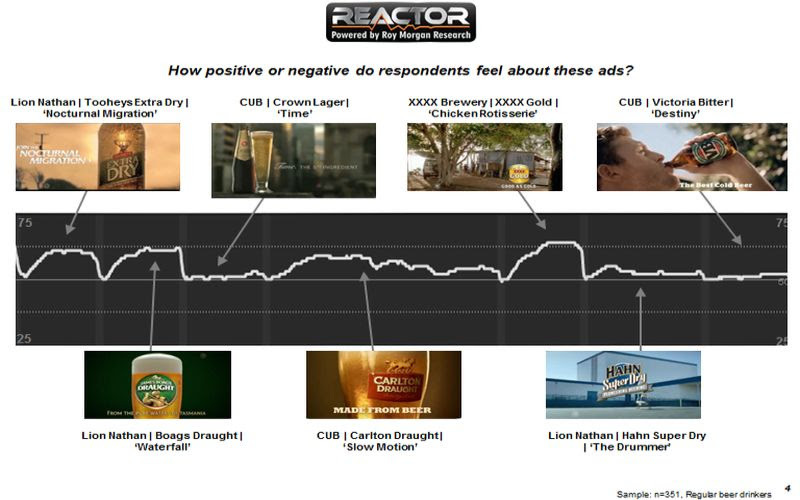 Roy Morgan Research has measured the real-time reactions of a group of viewers to seven ads from beer behemoths CUB, XXXX and Lion. To qualify for the study, respondents were required to have drunk beer in the last four weeks and be aged over 18. To test the ads, the researchers used an online tool that tracks and records viewers’ second-by-second emotional involvement and engagement with TV commercials, called The Reactor. The clear favourite was XXXX Gold’s ‘Chicken Rotisserie’ commercial, in which a group of mates attempt to cook a chicken over an old car engine. Men and women reacted similarly positively, resulting in an overall likeability score of 60. The XXXX ad also scored highest for Hot Zone (percentage of people scoring over 70), Peak Score (highest average achieved), Critical Likeability (second half of ad) and End Score (last three seconds). Interestingly, beer is not mentioned during the commercial, playing a supporting role instead (the friends are all holding stubbies of XXXX Gold). 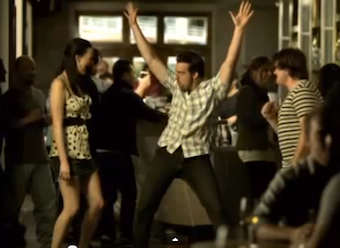 Carlton Draught’s famous ‘Slow Motion’ commercial attracted mixed responses. Aimed squarely at young males (and liked more by men than women), it depicts a series of classic pub ‘fails’ (inaccurate dart throwing, daggy dancing, spilling beer on girls) played out in slow motion against a cheeky re-imagining of a classic opera tune. Moments where the humour veers into crassness, however, met with immediate negative reactions from male and female viewers alike. Michele Levine, CEO, Roy Morgan Research, says, “Renowned for their big budgets and limitless creativity, beer commercials are rarely boring, and the results of our Reactor test show strong engagement from viewers. “Humour seems to work extremely well for this kind of advertising, and the most popular commercials tended to be funny. Quirkiness — as in the Toohey’s Dry ad or surreal Hahn Super Dry ‘Drummer’ commercial — was also well received.